On the back of the success of the Precision bass, Leo Fender turned his attention to a new bass guitar with a new design, sound, and style. The Jazz bass appeared in 1960. Slightly different body shape and neck, it had two single coil pickups that produced a cleaner sound with lots of mid-range. Immediately it was a success, as musicians from all genres began to use them. To make a list of bass guitarists who have used this wonderful guitar would take more space than we have, but if we did, that list would pay tribute to the quality and playing style of the Jazz bass. So, You Want To Change The Pickups On Your Jazz Bass? 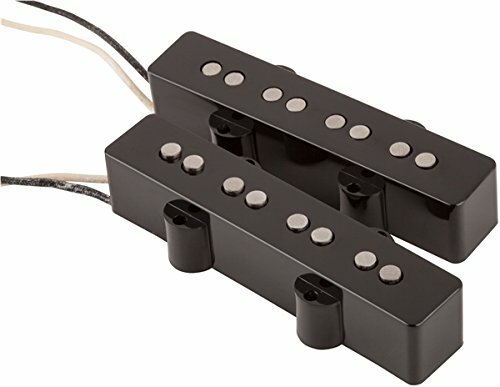 So, What’s The Best Jazz Pickups? You think you want to replace the pickups on your Jazz but are a bit wary of losing ‘that’ sound. EMG with its JVX pickups may alleviate your concerns. It is a new model with inbuilt new technology, but they have been determined to ensure the original sounds are still there. Why would you want to lose such a classic sound? 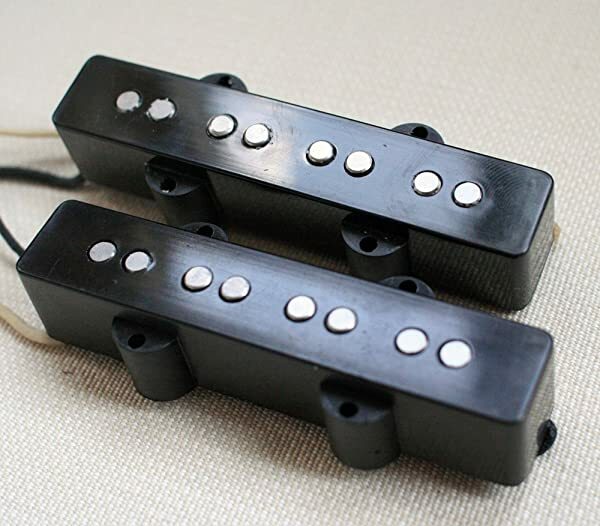 EMG produce quality active pickups, and these are a good example. They are a classically designed single coil pickup but the hum, so common in the past, has been taken away. They produce a great percussive feel that will appeal to Jazz bass fans, and they lose none of the power of the originals. The bass and treble settings are perfect, so there is little need for any adjustments. The lows are very deep, and the highs can be adjusted to be quite sharp, but the trademark mids are still there, ensuring that the Jazz sound still leaps out at you. The active status of the pickups, of course, add to that as there is less signal loss than there might be for passive pickups. Deciding to change pickups is one thing, fitting them sometimes quite another. If you are planning to make the change yourself, then EMG has made it very easy for you. EMG supply their “solder-less install system” which makes life rather easier. It includes all that is necessary for a quick and seamless change. 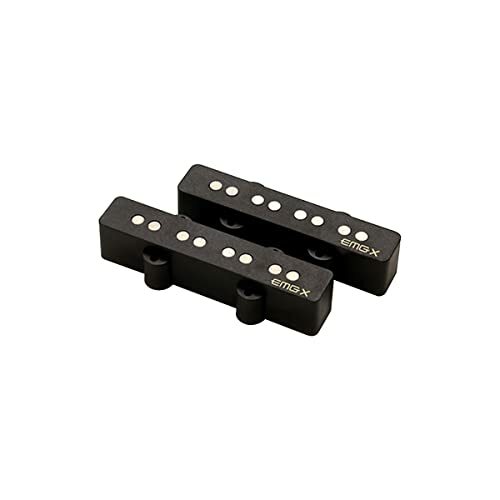 The JVX pickups are worth looking at if you want to retain a little of your Jazz sound. Priced towards the top end but a quality buy and won’t disappoint. These pickups are only for 4-string basses. The design gives you some of the retro Jazz sounds. Powerful at the top and bottom but with the mids still prevalent. They are quite expensive when compared with other similar pickups. Lindy Fralin has come up with what can only be described as a direct replacement for the original Fender pickups on your Jazz bass. They, like the originals, are crisp and clear with plenty of mid-tone. The bottom end is precise and does not boom too much; the top end sparkles with life. If you are looking for an exact replica though, you will not find it. The pickups are good, very good, but recreating that original sound is a tall order though they do come close. The sound is very clean and balanced, and they certainly have that percussive Fender feel to them. It is in the so important midsection that these pickups score. They can be smooth and refined but drive them a little, and they will growl at you. For those lucky enough to remember or indeed own an early 60s Jazz bass, they could growl at you as well. Whether Leo’s ‘deluxe’ bass was intended to do that is another matter, but, it could do. This opened up a new market for the Jazz and a lot of today’s rock musicians have, or do use, this guitar because of its variety and its gutsy sound. This pickup has captured that sound very well. 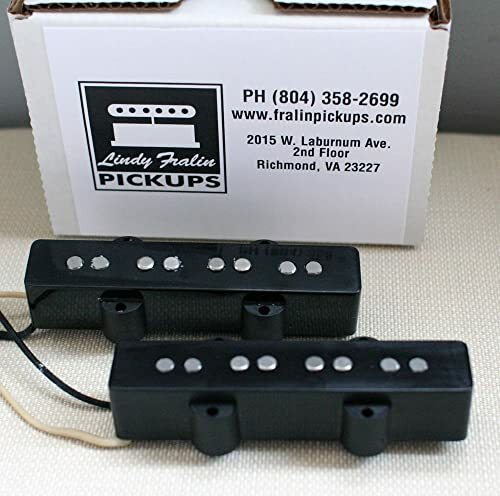 These pickups are for those Jazz owners who want a similar sound to what they have. That is what you will get. The passive nature of the pickups allow like for like sounds to be created and while they are not a carbon copy of the real thing, they are very close. Well worth having a listen to even though they do come up quite expensive. For a 4-string bass only. Creating that original Jazz sound. Rough edge to the midrange sound. It goes without saying that we must see what Fender have on offer as pickups for their Jazz bass. While they are recognized in the eyes of some as being the most important influential guitar manufacturer over the years, they have had some ups and downs. They have had periods where their guitars and accessories, including pickups, have been, how shall we say it, below the standards they have set. It is interesting then to have a look at what they have produced for their Jazz. 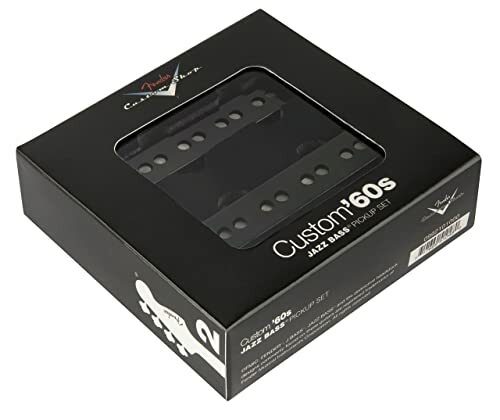 The custom shop 60s are the same pickups that are used in Fender’s Vintage reissue Jazz bass series. If you are unfamiliar with that bass, take some time to have a listen. The sound is just stunning, full and punchy with the trade-mark plenty of mids. They have taken the basic pickup and overwound them slightly for a high output which gives a little bit more attack especially in that mid-range area. Using quality materials like Alnico magnets and magnetic wire by Formvar they may have even improved the sound of this iconic bass. The vintage sound is still there but with this little bit extra added it gives one or two different sound options. But let’s remember this is the Fender Jazz we are talking about so changes in sound? Fender has got it right with this. They have made some subtle improvements but left the basics alone. Fitting is easy as its really just a straight swap. They are set in the mid-price range, so are good value. Kept the vintage sound and added just a little bit. Some may want more changes to the sound for more options. This pickup is a humbucker. More power across the frequency ranges and cancellation of any hum have given the Jazz a different sound. The vintage sound of the guitar has gone, to be replaced by a more powerful guitar with more options for sound variation. In fact, you can achieve a lot of sounds that would not have been possible from single coil pickups. We can just see the Jazz purists recoil in horror. A humbucker on a Jazz? Some people love their Jazz bass but wish it had just a bit more attack, a few more options, a few more sounds. They love how it feels in their hands but sometimes, only sometimes, wish it did a little more. It delivers a fat, punchy sound, strangely enough not unlike a Fender Precision when it is being driven hard through an Ampeg, and the ‘new’ Jazz is awash with plenty of tonal options. Fierce at the top end, angry at times at the bottom end, some players are going to love the sounds on offer that are now available. Set at a very competitive price these pickups represent good value for money if a little bit of change is what you are looking for. New pickup gives hum cancellation. Extra power and a new set of tonal options. Moves away from the vintage sound of an iconic bass guitar. 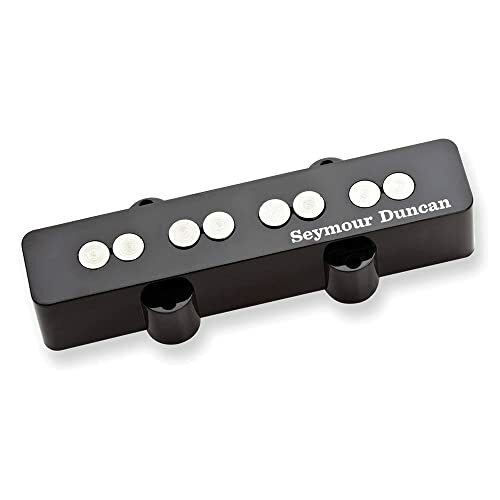 Seymour Duncan has produced a new pickup just for the bridge position on your Jazz. It is a very high output single-coil pickup designed to give you a big sound with some extra sustain. This pickup will give you an addition of power that will make the sound very punchy. It has been developed for the bass guitarist who wants that big sound with a lot of attack. In designing such a pickup, even though it is a single-coil, the vintage Jazz sound is buried. This pickup was never going to be a copy or an upgrade of the original sound. It is its own beast and goes its own way. This is another pickup that is moving away from the traditional sounds of this particular guitar and its traditions and taking it to new areas. Times and music change, and as the styles change so do the requirements to produce new ideas. 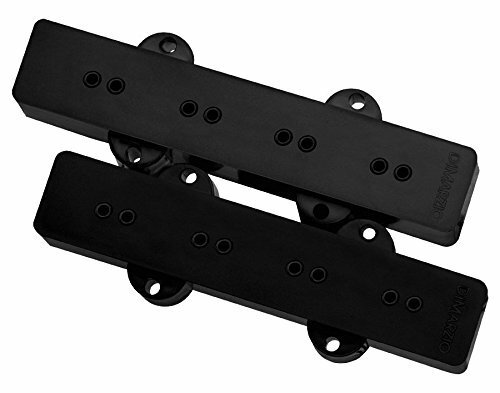 This pickup is designed to give the Jazz bass player a new set of options. If you are looking for a new bridge pickup that will maintain the vintage feel of the instrument, then this product is probably not for you. However, if you feel like you’d like to give your guitar something new, then this might be worth looking at. The price is set realistically and won’t break the bank. Brings a new sound to the Jazz bass. Powerful pickup delivering a big sound. Moves away from the traditional sound of the Jazz bass. Changing the pickups on your guitar might seem a small job and one that can be easily achieved. That is true, but the ramifications of changing even one of them are enormous. It can and may well alter the whole sound of what you have and what you are accustomed to, and what your band is used to. How will it impact not only on your sound but also the sound of those you are working with? We would suggest sitting down and asking yourself the question… Why do I want to change my pickups? We are going to throw some observations in the mix here. Is it because you feel that your Jazz needs an upgrade? Keep the sound but just make it fresh and new. Understandable and a good reason to go down the road to new pickups. Change the sound altogether, or maybe add a humbucker, that will massively change the sound. That sound could well have been the reason you bought the guitar in the first place. Fine, if that’s what you want to do. We have reviewed some of the options. All are very good pickups in their own right. Some follow traditional paths; others offer something new. There are options whatever your reasons for wanting the change, but what is the reason you want the change. We emphasize that point again because it is so important. The changes could be just what you and others you work with want, or maybe not. The pickups that have gone down the traditional route all capture to lesser or greater degrees, the feeling and sound traditions of this guitar. They allow the highs to shine and the lows to thump, but they have recognized the importance of the mids. The sound that made this guitar famous. Those that have taken another path have tried to add something to the sound — taken it in another direction. There are some great pickups to choose from. For us, this guitar is an icon. In the history books, it’s more than possibly the second most important modern-day bass guitar. Instantly recognizable, its sound has already spanned nearly 60 years, and it still keeps giving us that Fender Jazz sound. If we were to change pickups, we would remain traditional. Make every effort to maintain the vintage Jazz bass sound. All the other manufacturers offered great ideas, but we would go with tradition.